I must say that I am no stranger to this Belgian Tripel. This is hands down my favorite Tripel. This is the gold standard that I compare all tripels. I have had this in both bottle sizes several times. This was also one of my 6 draft biers at last years Belgian Event (link) We served this beer at a group dinner party last Sunday night and I just happened to have an extra bottle, so I figured I would go ahead and have a full review. This Tripel is made from the original 500 year old Carmelite Monastery recipe (hence the name). According to their website they tried to change it a few times but it never comes out as good. So here we go I can’t wait to give this a full review. The bier pours a cloudy pale straw with golden hues and a rich bright white head. This first glass out of the 750ml bottle is so carbonated the rich head imploded in just a few minutes. I have seen this head stick around for a long time so I assume it is something unique to this bottle. The nose of the brew is delightfully inviting. There are sweet malt aromas of barley and wheat with spicy notes of clove along with some floral notes of honey and citrus. This nose is so inviting it would be a form of torture to just inhale these aromas without being able to taste it. Ahhh, wonderful, simply wonderful. This is simple elegance, that’s what this is, simple elegance. Sweet mix of malts up front on the tip of the tongue, then a very refreshing effervescence that is also very refreshing in mid-sip. The back-end is smooth and very easy to swallow. The finish is just amazing with some citrus and spice notes. There is a unique subtle complexity to this ale. Each sip you pick up a little more. One sip it’s like drinking a Belgian Wit with coriander and clove spice notes. The next sip is smooth and refreshing like a summer ale with citrus notes. I hate to repeat myself but this is really “Simple Elegance”. Well, the second glass poured just as bad with the head fizzling away fairly quickly; for a Belgian that is. It did stick around for a while but not like it did last Sunday night. I’m beginning to suspect that my glass may be dirty. (ashamed to even suggest that) This bier is not flat it is highly carbonated; there is a tremendous amount of bubbles rising up from the bottom of the glass. The head just seems to implode from within. Needless to say I am puzzled by this head. I even got another glass (mainly because I couldn’t believe that I would have a dirty beer glass). The second glass did the same thing, the head diminished fairly quickly. This must be something unique to this bottle. Part of my obsession with the head is that this head is supposed to stick around. They actually designed this specific glass to capture that head and add a creamier mouthfeel to the bier. That is what I’m missing in this review the creamy mouthfeel. OK enough with the head or lack there of, let’s get back to the review. I don’t have my thermometer so I really don’t know how warm this beer is. I would suspect just above room temperature. It warms nicely. The flavors are more enhanced now at these temperatures. It is less carbonated so it is not as crisp but every bit as good if not better then it was cold. There is a richer caramel malt flavor now and a much creamier mouthfeel. This really is a phenomenal bier. 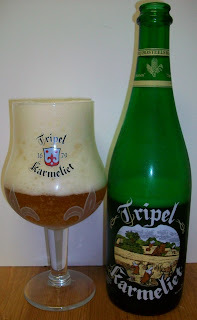 Some Belgian Tripels are very high is spice or alcohol. To me this is a perfectly balanced tripel. There is an exquisite simple elegance to its subtle complexities fruity esters and spicy notes. This is also a very easy drinking, highly enjoyable and still refreshing. This is a solid A+ for me. If you don’t like this beer then you just don’t like Belgian Tripels. One last time, “Simple Elegance”, that just about sums it up. The thermometer is broken. My better half managed to damage it and in my attempt to fix it I really broke it. This is much better then the Leffe. You will definitely like it.